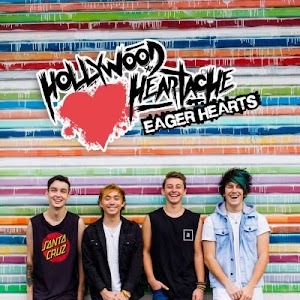 Hollywood Heartache is an Australian based pop-rock band, with four members AJ Hawkins (Vocals), Kevin Kojima (Vocals/Guitar), Will Parsons (Vocals/Bass) and Josh Entwistle (Vocals/Drums). They are making their fans proud as they just released their debut EP ‘Eager Hearts’ on October 28 2015. This 5-track EP is full of summer and energy vibes. The presentation, as well as the quality of the recorded tracks on the EP remind me so much of 5 Seconds of Summer. Plus if you had told me that the songs had been produced by some big name producers, I would totally have believed it. The recording skills are so professional and high-quality, as if the songs had been lifted from One Direction’s albums – yet the EP was self-engineered, mixed and mastered. With only 5 tracks on this EP, it manages to showcase both fast-rhymed and slow-paced songs and how well Hollywood Heartache does both. The first song in the EP ‘Summer Romance’ (their lead single) is a power pop song which gives you a full taste of this fun band. My favourite song on the EP is ‘High School Sweetheart’. A song about a high school love story with lyrics which are romantic but not too cheesy. The vocals and musical instruments are impressively blended in the chorus which makes it absolutely pleasant to listen to over and over again. These upbeat songs definitely appeal to teenage audience and will make you want to dance along with. Definitely worth a listen if you are fond of pop-punk bands like All Time Low and 5SOS.